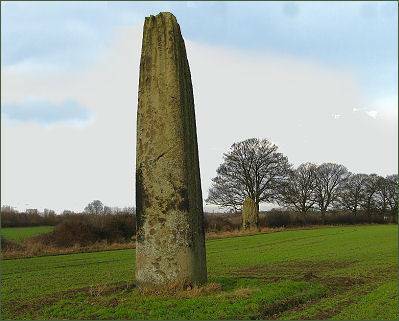 The ancient monuments known as Devil's Arrows consist of three huge standing stones or menhirs which are situated near where the A1 road crosses the River Ure at the small town of Boroughbridge in North Yorkshire and date to the prehistoric era. The tallest stone stands at 22 feet 6 inches high, making it the tallest menhir in Britain after the Rudston Monolith in the East Riding of Yorkshire which measures 25 feet in height. This stone stands at the southern end of the alignment and is partly hidden beneath trees and is in its own fenced enclosure on the south side of a road that leads from Boroughbridge to Roecliffe. The stones are composed of millstone grit, the most likely source of which is Plumpton Rocks two miles south of Knaresborough and a distance of around nine miles from where the stones stand. Distinctively grooved by millennia of rainfall, the stones stand around 150 feet from the A1 road. It is believed that the alignment originally included up to five stones. One of these was situated near to the central stone and is believed to be the one recorded as standing by the antiquary John Leland in the early part of the sixteenth century. About thirty years later, the Elizabethan antiquarian and historian William Camden refers to four stones in his Britannia, which was published in 1586. In which he recorded that "one was lately pulled downe by some that hoped, though in vaine, to finde treasure." One was apparently displaced during a failed 'treasure hunt' during the eighteenth century and later used as the base for a nearby bridge over a river. All three surviving stones are heavily weathered and fluted at their peaks with the northern and southern stones having various indentations which could be interpreted as being cup marks. The outer stones are 200 and 370 feet away from the central stone and form an alignment that is almost straight, running NNW-SSE. It is understood that they may have been arranged to align with the southernmost summer moonrise. Legend states that the site's name derives from an account of the Devil trying to fire arrows at the nearby Christian settlement at Aldborough from Howe Hill, the arrows fell short and landed in a line in the field. The stones are part of a wider Neolithic complex on the Ure-Swale plateau which incorporates the Thornborough Henges, which stand 10 miles to the northwest. Known as the 'The Stonehenge of the North', it is one of the most important ancient sites in Britain. It consists of an unusual prehistoric monument complex which features three aligned henges from which the site derives its name.